And then we ordered coffee cream doughnuts! So American, and I knew I wouldn't get the opportunity here so I went for it. It was not the best doughnut I've had though. 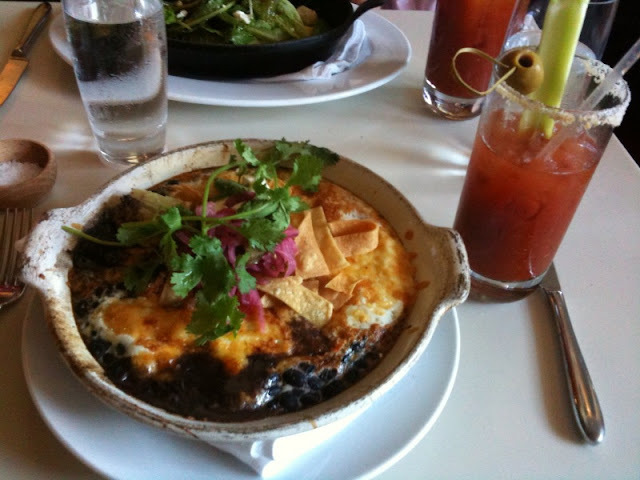 When I returned to Stockholm, I wanted to share a good huevos racheros with my husband since he loves Mexican food. I brought home with me some cans of chipotles in adobo sauce, which make all the difference. I've actually taken them out of the can, pureed them, froze them in ice cube trays, and then in a container so that it's convenient to use whenever. Our last brunch was perfect because my husband and I enjoyed the best huevos rancheros (it was so good that we would wait in line and pay for it!) and melt-in-your-mouth homemade cinnamon buns. I'll post that recipe later! 1. Cook the beans: Bring beans and water to a boil, then pressurize 2 whistles on your pressure cooker. Drain after it's cooked. If using canned beans, rinse and drain the beans. 2. In a pot with oil, golden brown the onions, then add garlic, bay leaf, turmeric, cumin, coriander powder and cook for a minute. Then add tomatoes and chipotle sauce and cook for about 5 minutes. Add the cooked beans and cook for another 5 minutes. Add some water if you want a thinner consistency. Season with salt and pepper. 3. Preheat the oven to 425F or 220C. 4. Assemble: In 2 greased ovenproof dishes, arrange the toasted tortillas (if using), and evenly distribute the beans. Then add 2 fried eggs to each dish, along with a handful of grated cheese. Bake until the cheese is melted and slightly golden, about 5 minutes. Take out of the oven and garnish with chopped jalapenos, red onion, vegetarian sausages, fresh coriander, a dollop of yogurt or sour cream and sliced avocado.